I initially became interested in medicine as a career choice by virtue of my early exposure as a teenager. I went to Michael E. DeBakey High School for Health Professions in Houston, TX. 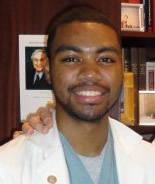 During my junior and senior year, I interacted with health professionals during clinical rotations. Obviously, not an experience afforded to all high school students, but looking back this played the largest role in my development as a physician. I still vividly remember my sessions in the cardiac cath lab where I was scrubbed in, mesmerized, and learning firsthand the basics of coronary anatomy; a truly special experience for a 17 year old kid! Upon graduating from high school, I pursued a degree in biological sciences with the ultimate intent of matriculation to medical school. In 2006, after completing my first year in college, I participated in the SMDEP program at Duke University School of Medicine. It was a great opportunity to once again be immersed in clinical medicine. The mentorship and support provided along with the connections I established in those six weeks were the greatest strengths of the program. I found the most surprising aspect of professional school to be the amazing intellect of the people around me. Medical school attracts a truly special group of not only brilliant, but artistic, and humanistic people. The best part, many of these classmates become your future colleagues, and some end up being your closest friends. My best piece of advice to potential medical students is to remember your motivations for pursing medicine. Be sure to write them down and include how you plan to use medicine as a vehicle to help you to achieve your goals. It really helps to think of medicine in that perspective, because you dig a bit deeper, and envision how medicine can enhance your life. In addition, it can help you determine how to utilize your new skills to assist others (not to mention, it can come in handy when it’s time to write your personal statement and on those challenging days when you just need to remember why you chose medicine). I feel this is often overlooked, because we never give ourselves enough credit, especially early on in college and medical school. You have the ability and obligation to make a tremendous difference in the lives of others. Taking a step back and looking at the 50,000ft view is helpful in discovering your role in the bigger picture that is life. Also, remember the process of becoming a physician is lifelong, while there are finite numbers of exams and applications you’ll have to endure, the true measure of your achievement lies in those moments when all else becomes irrelevant and it’s just you and your patient.